Students learn dictionary skills to help find meaning, pronunciation, syllabication, and origin of familiar and unfamiliar words. Then they work in groups to go on a dictionary scavenger hunt. Finally, they take a closer look at word origins of our English language. In this experience, students learn dictionary skills to help find meaning, pronunciation, syllabication, and origin of familiar and unfamiliar words. Then they work in groups to go on a dictionary scavenger hunt. Finally, they take a closer look at word origins of our English language. 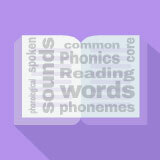 Use a dictionary to determine word meaning, pronunciation, syllabication, and word origins. What is a dictionary? You have probably used one, but did you ever look up the dictionary definition of dictionary? If you do, you may find a very different meaning in an online or app dictionary than you do in a print dictionary. That’s because a dictionary used to mean a reference book with an alphabetical listing of all the words in a particular language. That’s still what most people think of when they hear the word dictionary. But technology has given us versions that speak the words so we can hear their pronunciation. They link quickly and easily to related words, and even track the origins of words back to ancient times by harnessing the power of the Internet. In this experience, you will practice using dictionaries. Use print and digital dictionary skills to determine word meanings, pronunciation, syllable breakdown, and origins. Turn to a partner. Together, use both a print and an online dictionary to look up the word dictionary. Write a brief comparison describing the differences between the print and online entries. Examples might relate to syllabication, pronunciation, word origin, plurals, length or number of definitions, differences between definitions, or other details.